LITTLE ROCK, Ark. — Arkansas’ governor signed a measure Friday requiring voters to show photo identification before casting a ballot, reinstating a voter ID law that was struck down by the state’s highest court more than two years ago. The bill signed by Republican Gov. Asa Hutchinson closely mirrors the law enacted by the Legislature in 2013 that was found unconstitutional by the state Supreme Court the following year. The latest law is aimed at addressing the argument by some justices that the 2013 law didn’t receive enough votes in the Legislature to be enacted. Unlike that measure, the latest version of the requirement allows voters with a photo ID to cast a provisional ballot if they sign a sworn statement confirming their identity. “This law is different, in a number of ways, than the previous law, which was struck down by the Supreme Court. It should hold up under any court review. For those reasons, I signed the bill into law,” Hutchinson said. 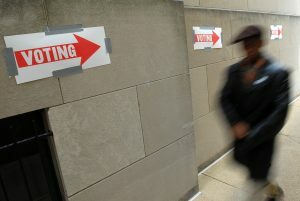 The legislation is one of two efforts by lawmakers to revive the voter ID requirement. Earlier this month, they voted to put a proposed constitutional amendment imposing the requirement on next year’s ballot. Four of the justices who struck down the 2013 law are no longer on the court, and one of the new justices is a former Republican state legislator. The three justices who said the 2013 law didn’t get the two-thirds vote needed to change voter registration requirements remain on the court. The justices no longer on the court weren’t voted out of office because of the ruling. Three retired and the fourth was an interim justice appointed to the court whose term expired at the end of 2014. The American Civil Liberties Union, which filed the lawsuit that led to the previous law being stricken, said the latest measure raises the same concerns that voters will be disenfranchised. Holly Dickson, legal director for the ACLU of Arkansas, said the sworn statement provision in the latest law is an improvement but that the measure still will risk hurting voters. “Of course we have concerns that voter ID is going to do harm because that’s been Arkansas’ experience so far with voter ID,” Dickson said. Like the previous law, the new measure requires election officials to provide photo identification to voters free of charge if they don’t have any other photo ID. The measure will take effect 90 days after the Legislature formally adjourns, which is expected in May.